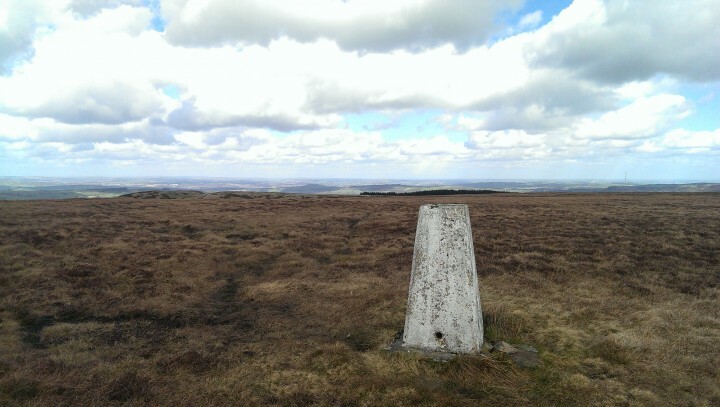 As part of my mission to visit my local trig points, I devised this varied walk which took in reservoirs, woodland, moorland and farmland. 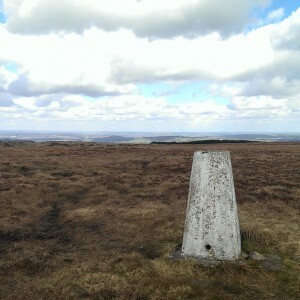 At less than 6 miles it packs the features in. I’d driven through Hade Edge many times but had never stopped off and was oblivious to the beautiful Holme Styes Reservoir. 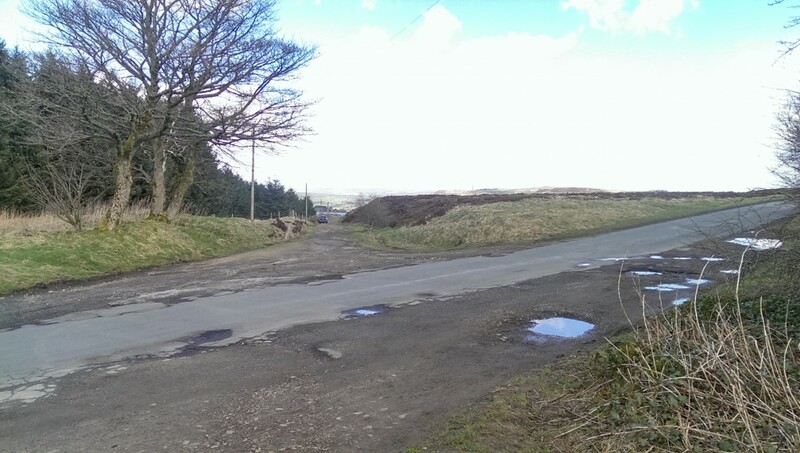 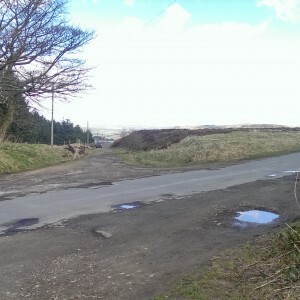 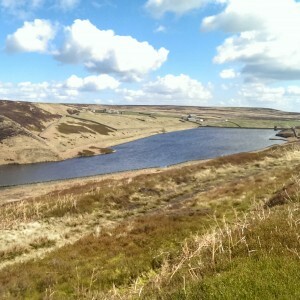 There is plenty of on-road parking on the wide lane that leads from the village to the reservoir so leave the car there and set off down the track alongside the reservoir. 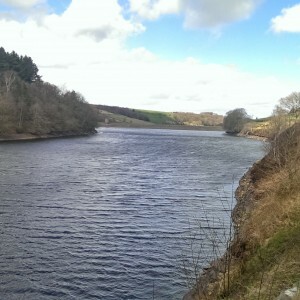 At the end of the reservoir, cross a small bridge and head off into the woodland up the longest hill you’ll encounter on this walk. 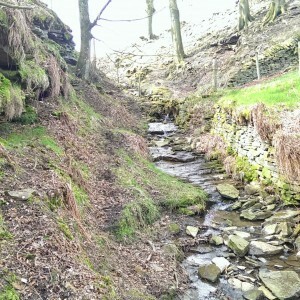 It’s not that steep and being early in the walk, not that energy sapping either. 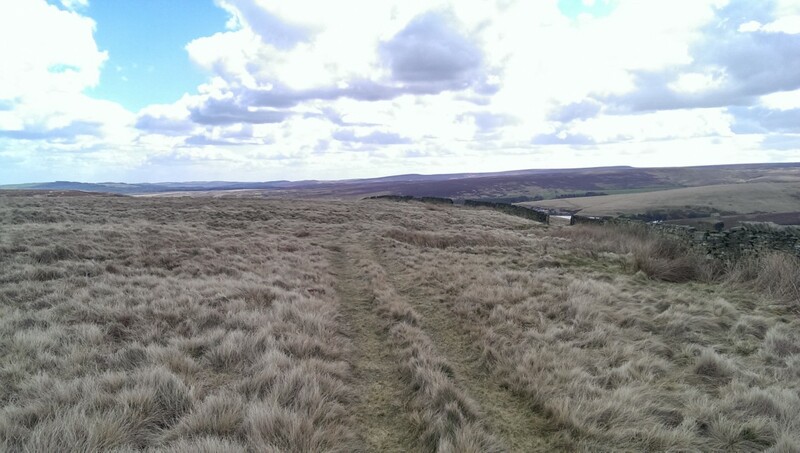 If your walk is like mine, this is the last time you’ll see anyone for an hour or two. 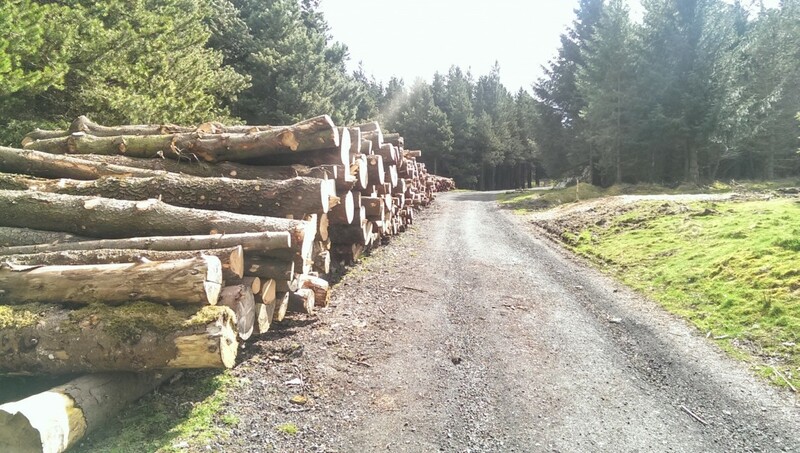 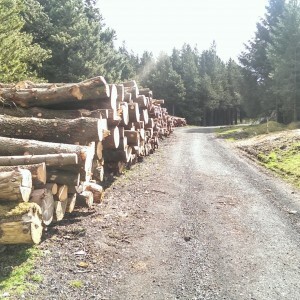 Clough Wood appears to be a working forestry, judging by the log piles on the trackside. 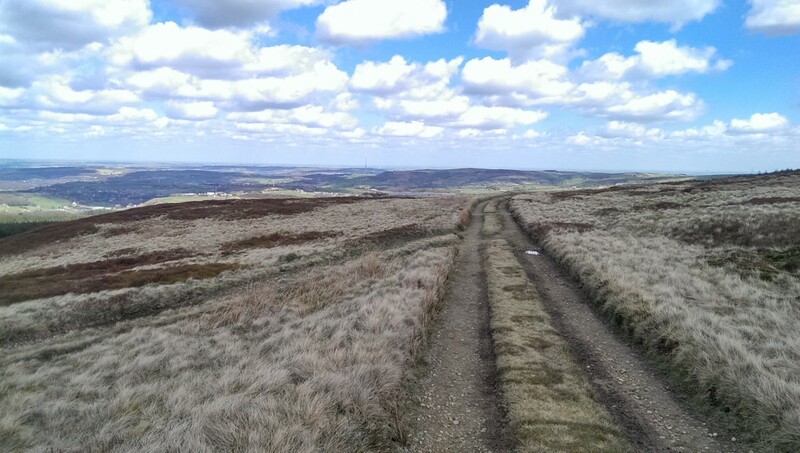 Once you’ve made your way through the woods, you’ll come to a road which you cross to get onto to open moorland. 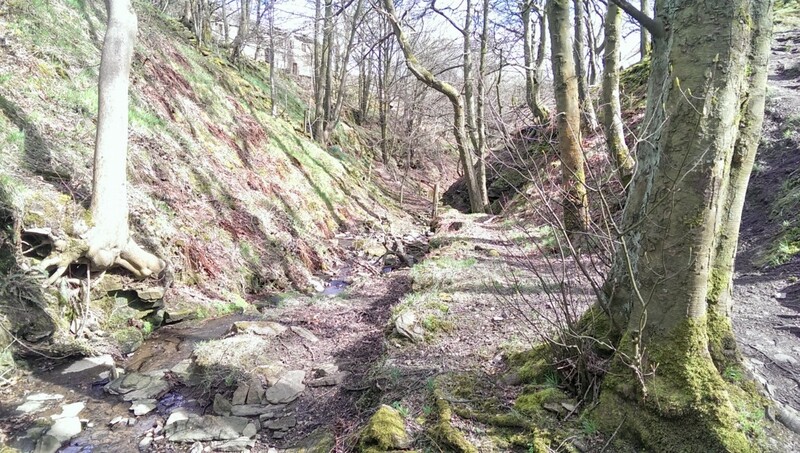 You can see evidence of an industrial past here with many disused quarries, tips and unused paths. 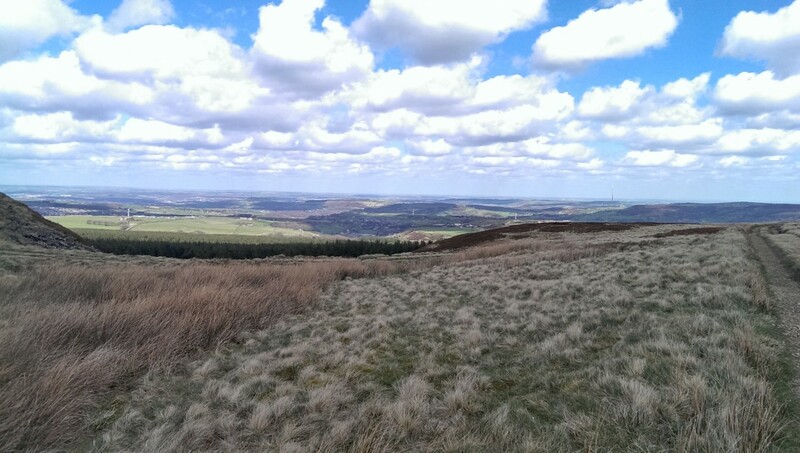 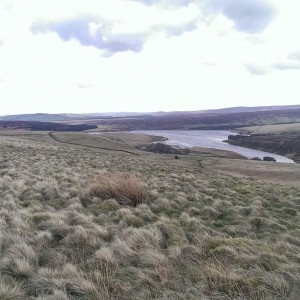 After a short wander, you’ll find yourself looking down towards Harden Reservoir. 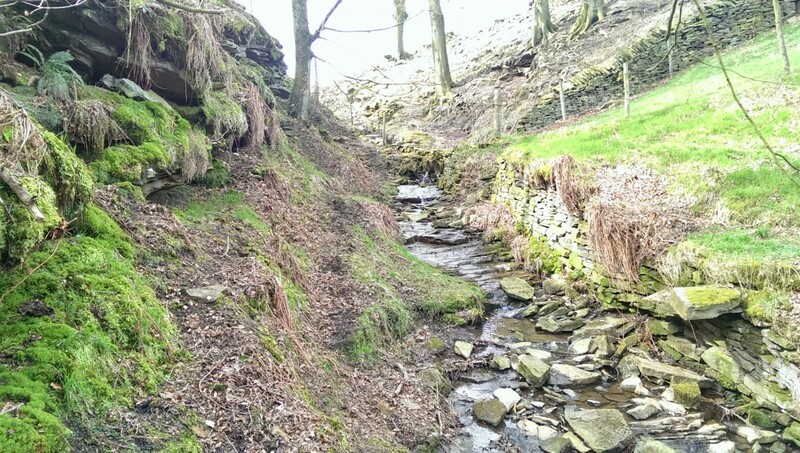 You’ll also see the track you’re due to follow on the other side of the shallow valley. 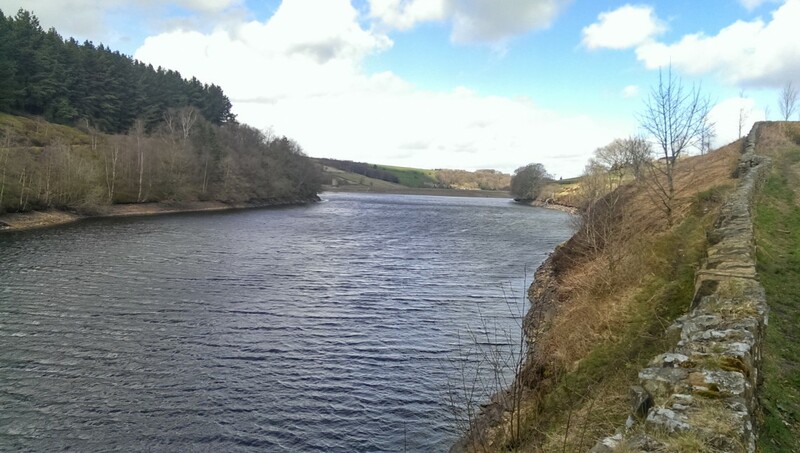 It really is wonderfully remote for a place so near to a couple of roads and the car park for Winscar Reservoir. 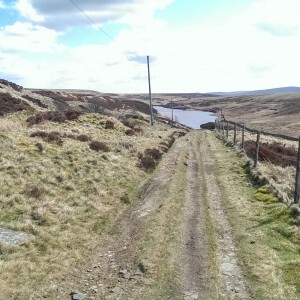 Once past the reservoir, you’ll ascend up onto Snailsden Moss. 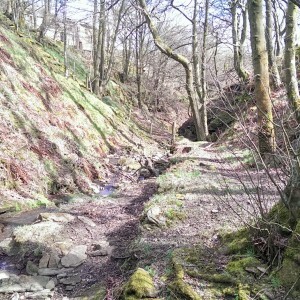 Passing more disused quarries, you’ll soon reach a junction where you shall turn right towards the highest part of this walk. 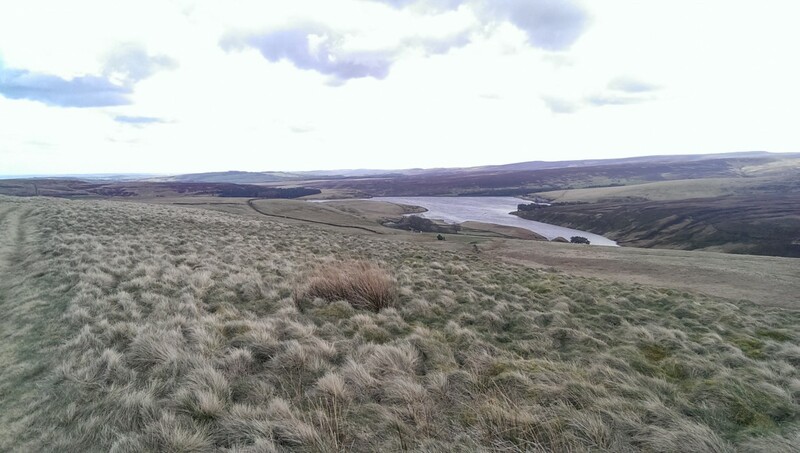 Looking left, you’ll see Winscar Reservoir with its large car park and leisure walks but today we’re getting away from it all, high up. 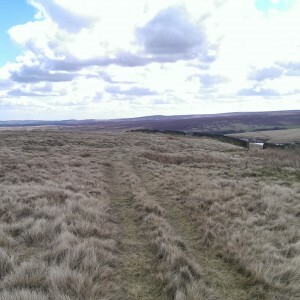 The next stage of the walk along Snailsden Edge is quite a hard slog if the wind is in your face. 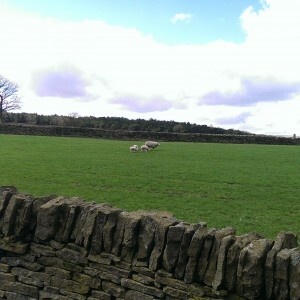 While walking this stretch, I thought of doing this walk in an anti-clockwise direction next time. 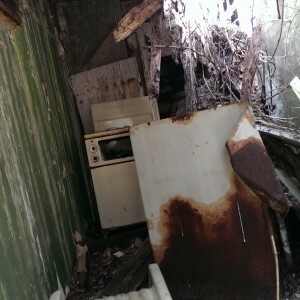 I’ll leave this up to you. 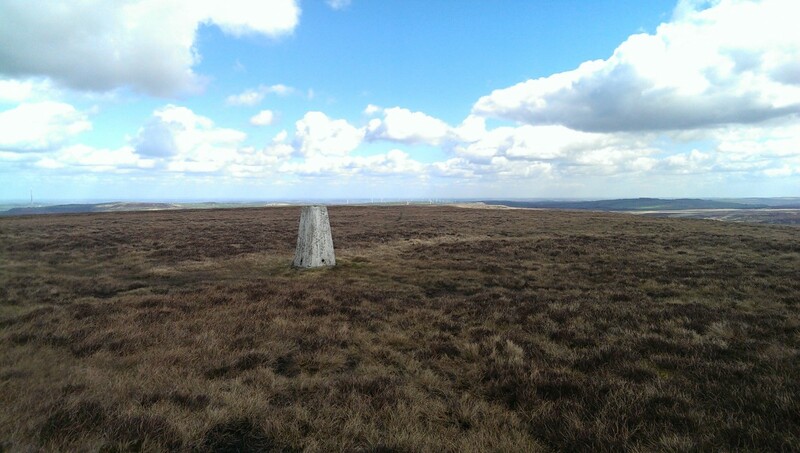 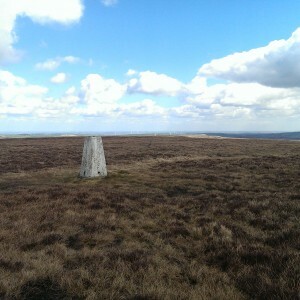 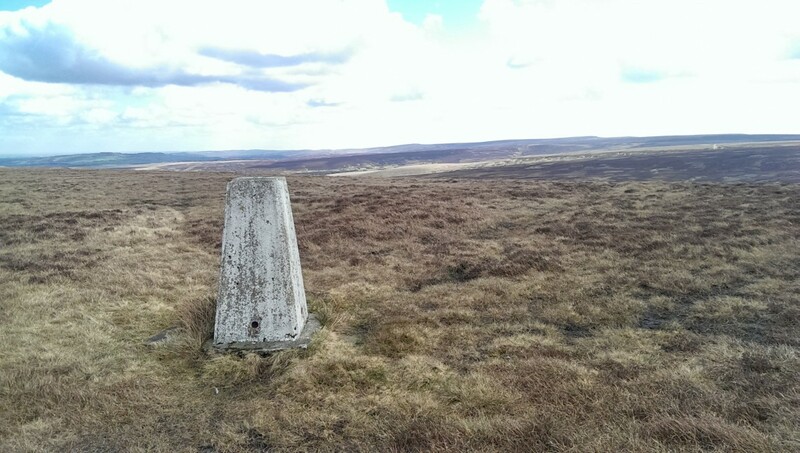 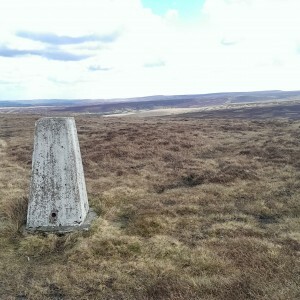 Snailsden trig point is to the right of the path so you’ll need to keep an eye out for it. 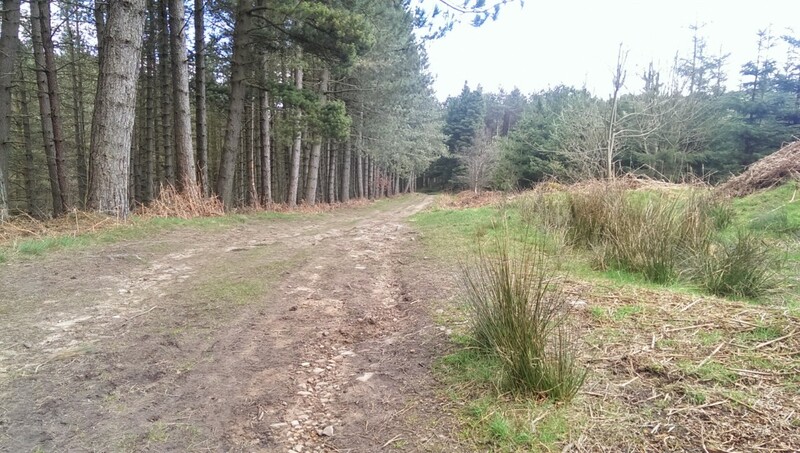 Once you’ve found and visited it, you’ll see that it’s on a quad bike path not shown on OS maps which you can follow back onto the main path. 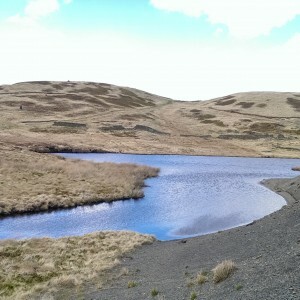 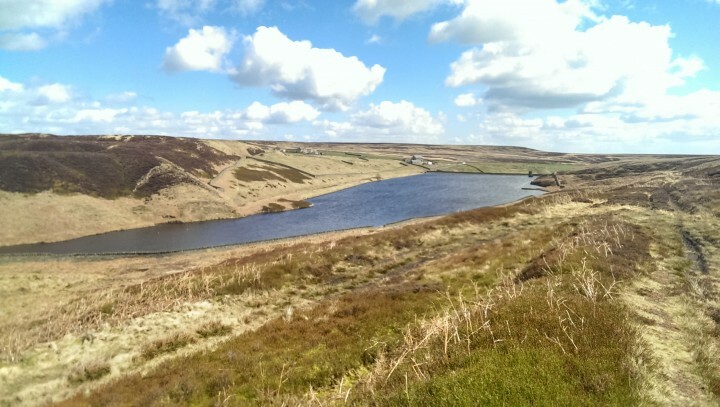 Coming down off the moorland, you’ll find yourself at Snailsden Reservoir with Cook’s Study Hill behind. 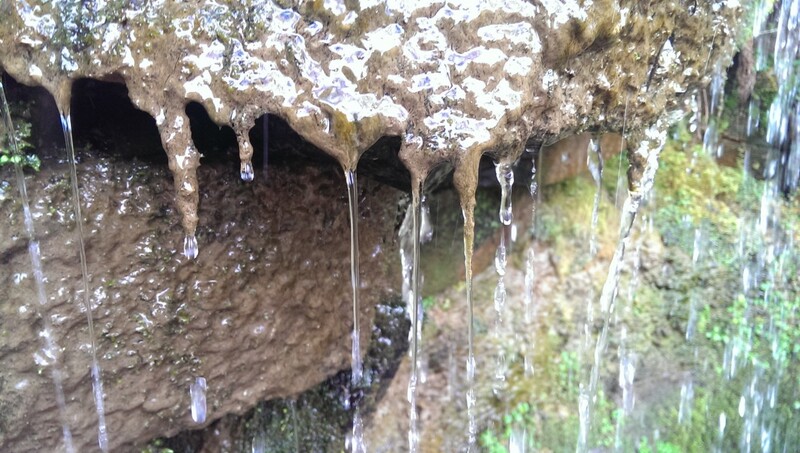 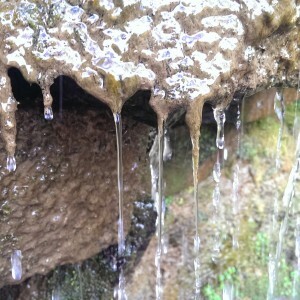 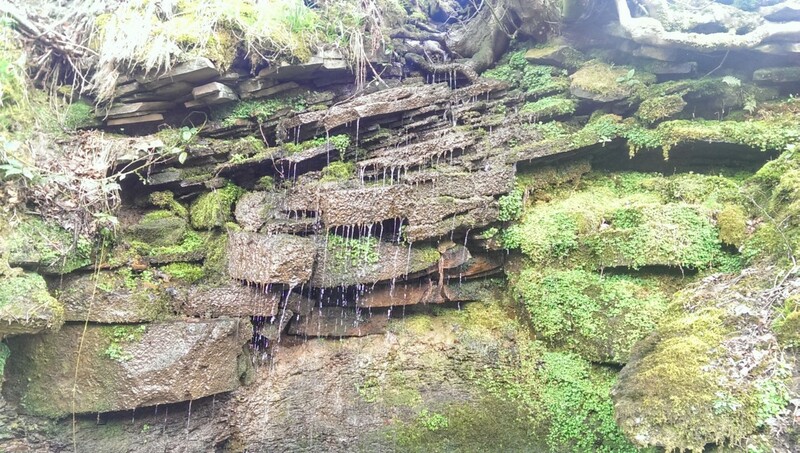 It’s a beautiful and peaceful place where I stopped for a drink and bite to eat, sat on some rocks beside the water. 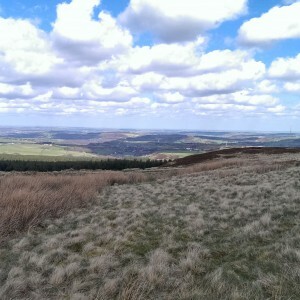 A small climb is ahead, walking over a kind-of col on the top of Cook’s Study Hill. 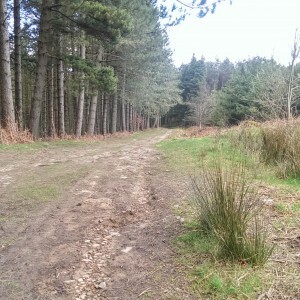 From here, follow the track down towards the road crossed earlier. 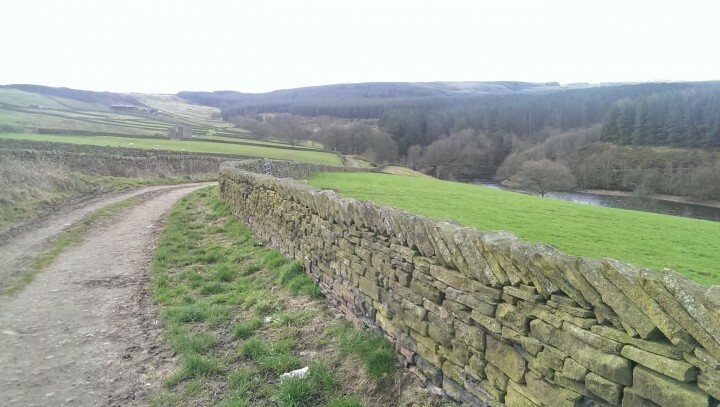 Here follows a bit of road walking – something I try my hardest to avoid on walks I plan. 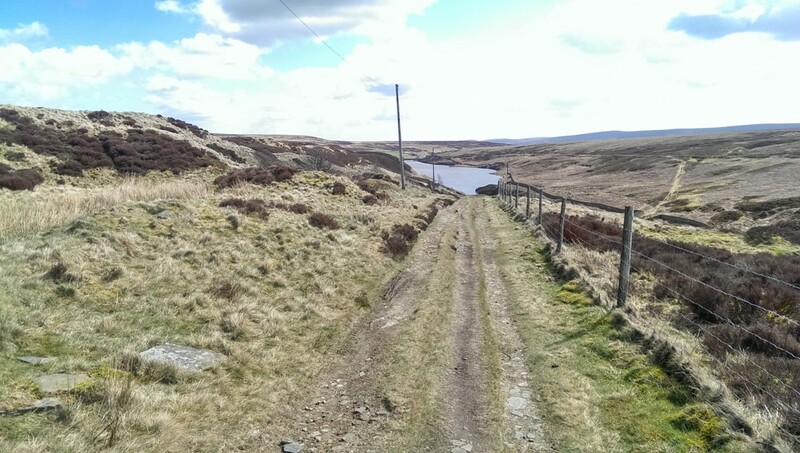 However, this road is extremely quiet (I only saw one car) and with the woods on one side and moorland on the other, not something worth trying too hard to avoid. 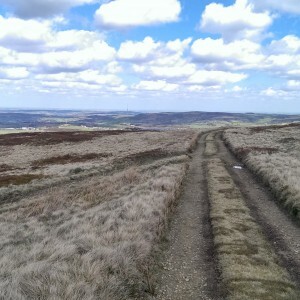 Following the road, you’ll soon come to a junction where the Kirklees Way crosses. 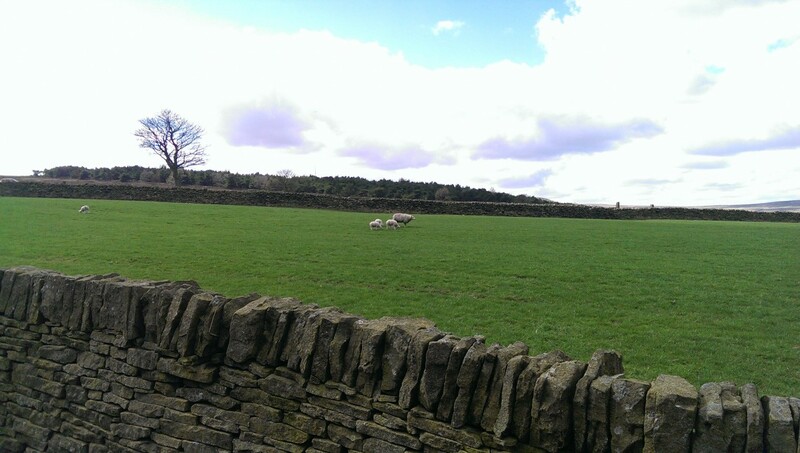 You’ll bear right, here, walking with a field of sheep on one side and the woods on the other. 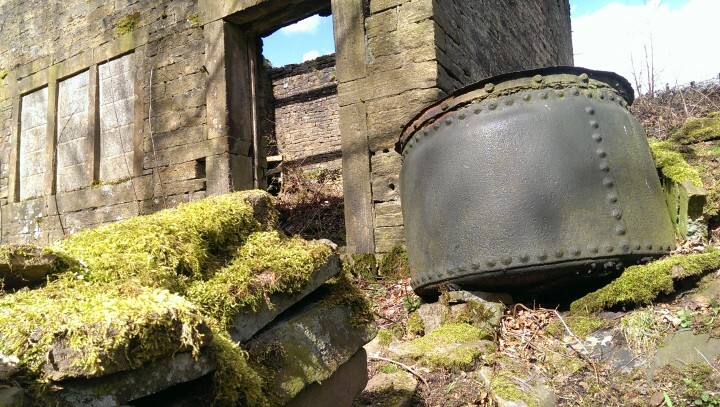 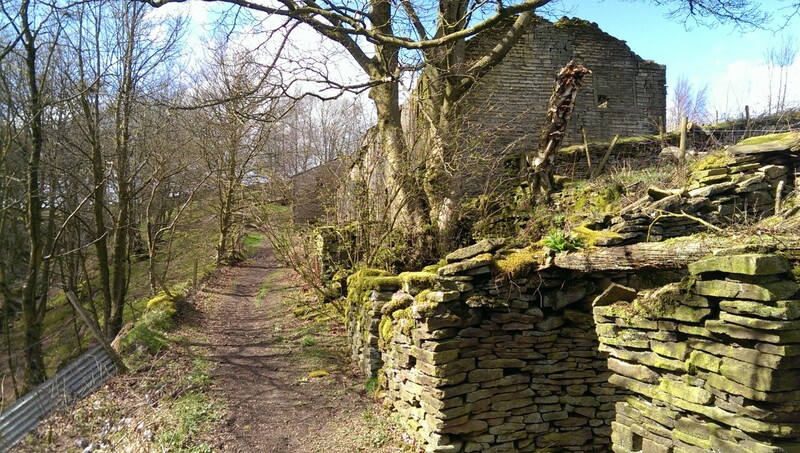 It soon opens up on both sides and you’ll walk past a particularly isolated farm shop. 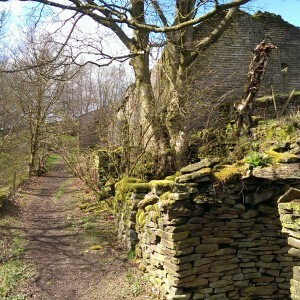 Once you reach the edge of the woods again, you’ll turn off the Kirklees Way and walk beside the woods again until you reach Fox Clough and turn right. 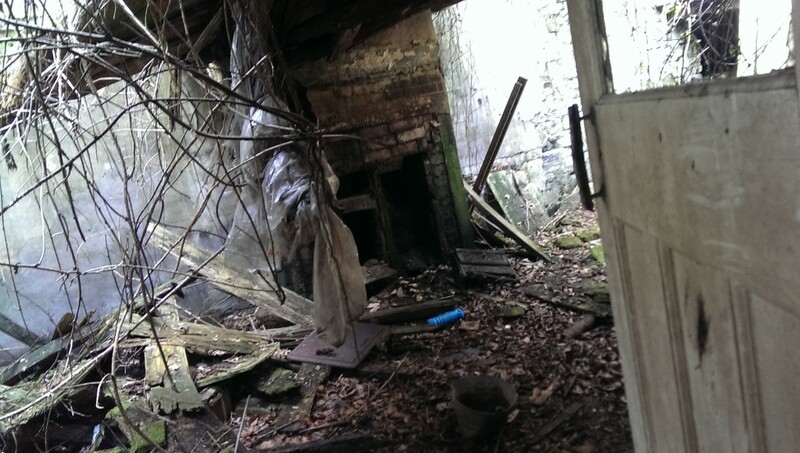 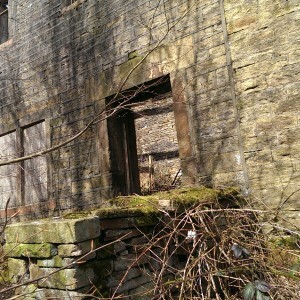 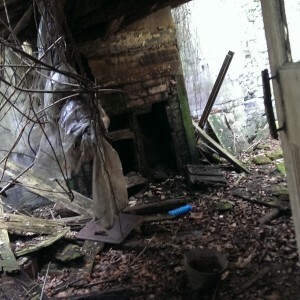 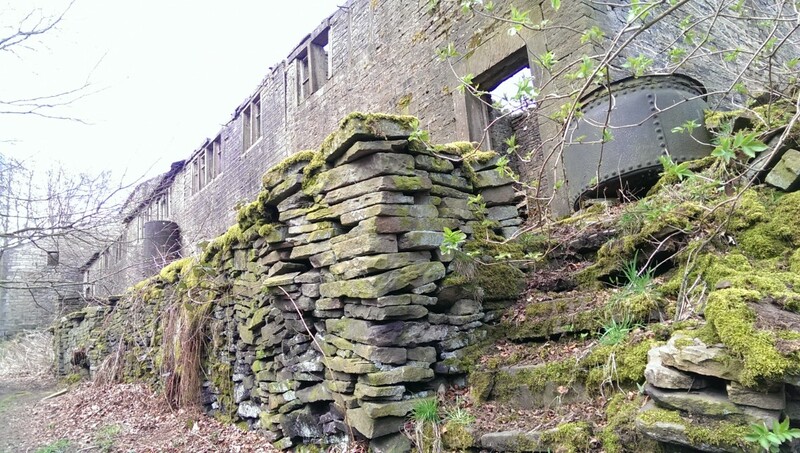 Here you’ll find large abandoned farm building which is worth a look inside. 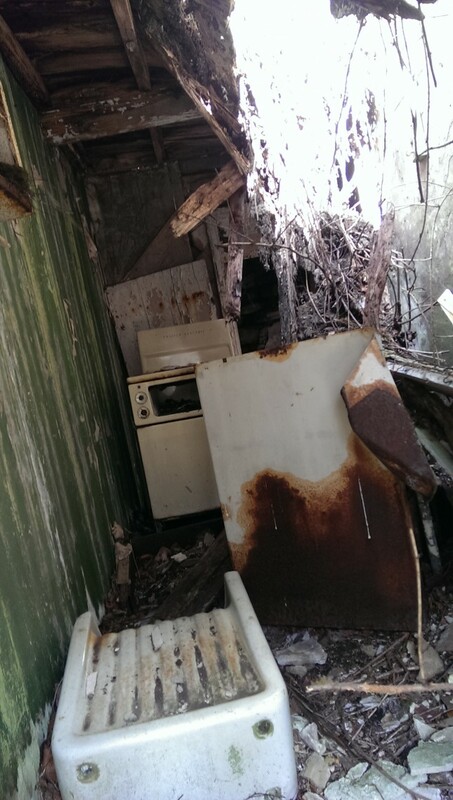 The gas cooker that’s in the old kitchen looks a good 40 years old so it looks like the place has been uninhabited for a while. 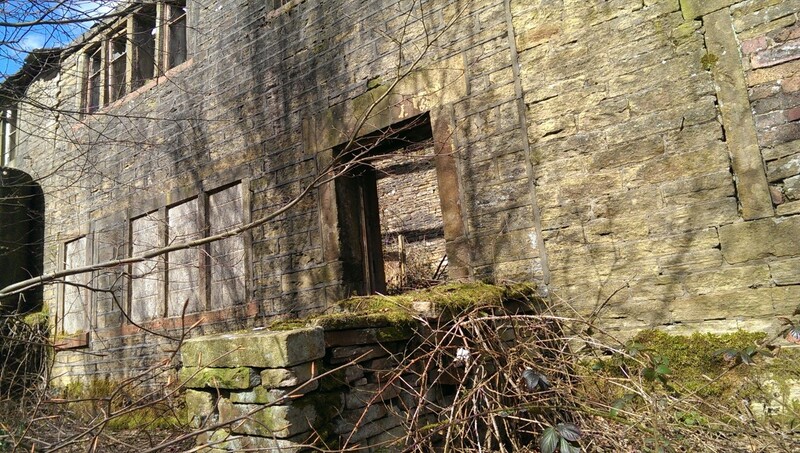 The brickwork is in remarkably good condition but the roof and windows certainly aren’t! 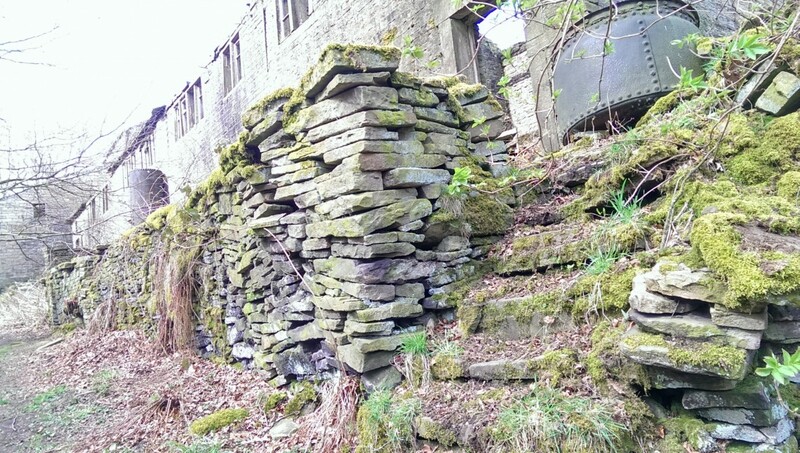 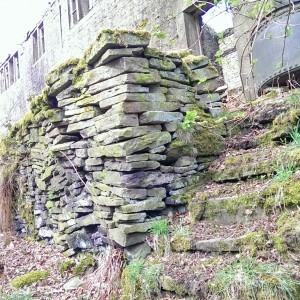 Nature is gently reclaiming this land. From here, you’re on the home stretch. 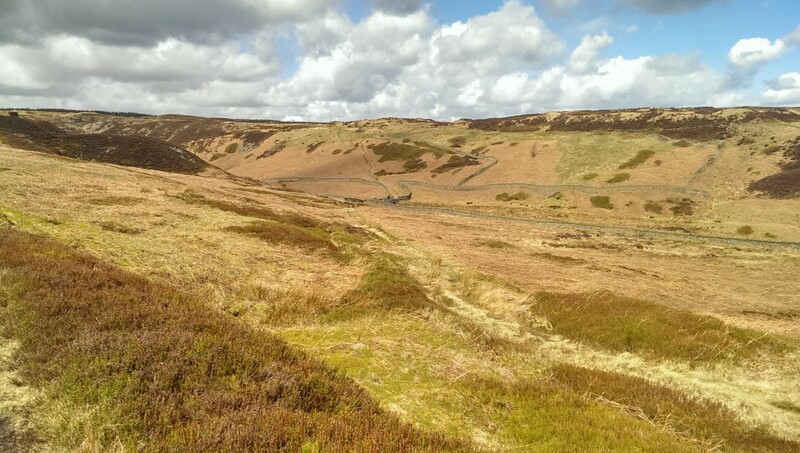 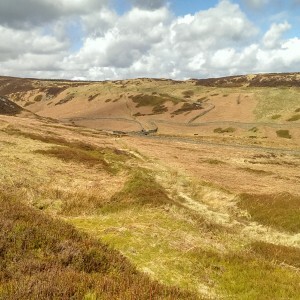 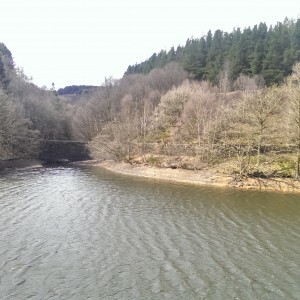 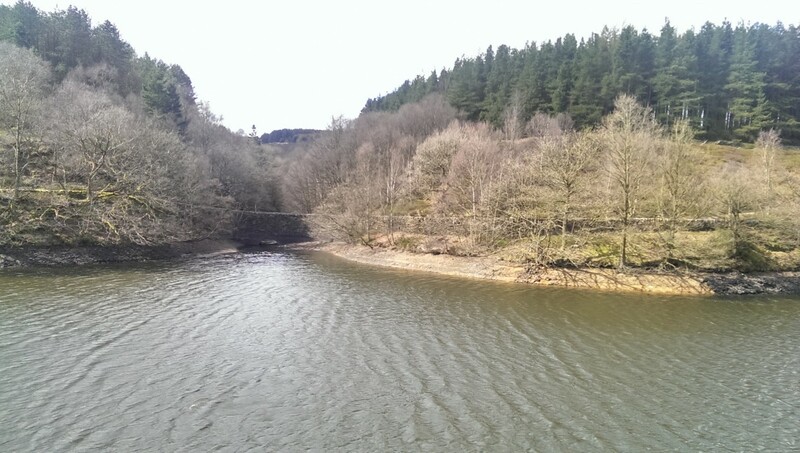 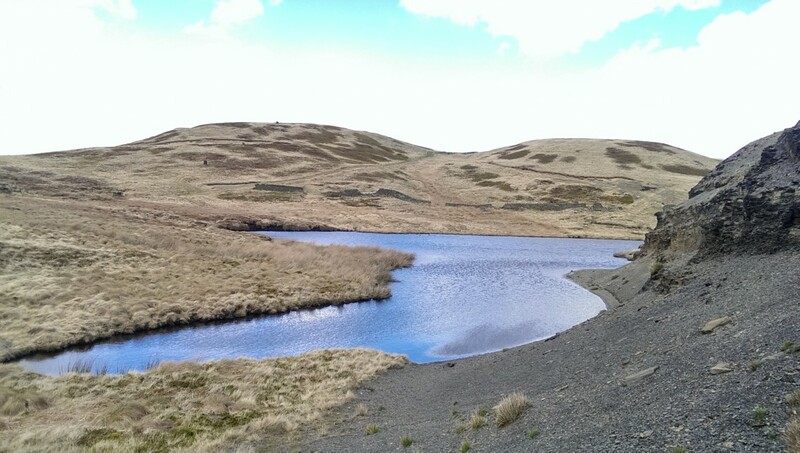 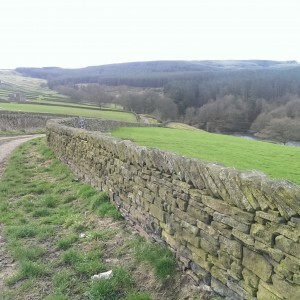 Follow the path and you’ll find yourself at the dam of Holme Styes Reservoir from which you’ll walk up the path, back onto the road and your circular route is complete, 5¾ miles done. 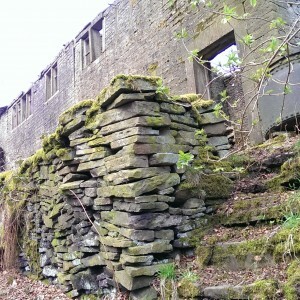 Click images for larger versions. 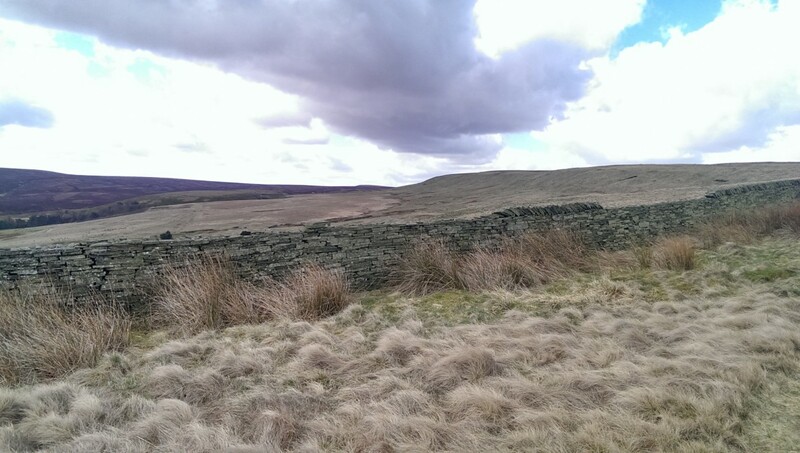 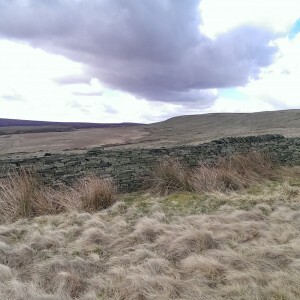 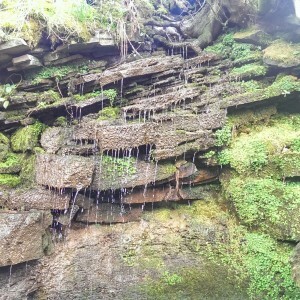 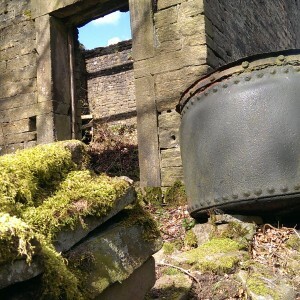 Images of 1920px along the longest edge are available from the Snailsden Edge from Hade Edge Flickr album.